Army veterans Ken Davenport, left, and Don Wuertz, right, were accompanied by Delaware Mayor Carolyn Kay Riggle, middle, on an Honor Flight to Washington D.C. this past weekend. Honor Flight Columbus made its 87th flight to Washington D.C. this past weekend, the plane transporting more than 80 veterans from around central Ohio. Among them were two of Delaware’s very own, Don Wuertz and Ken Davenport. Wuertz and Davenport are both Army veterans who served during Vietnam. Wuertz served from 1961-63 and was promoted to E-5 (sergeant). Davenport was in from 1955-1975 and achieved the rank of master sergeant. The two were accompanied by Delaware Mayor Carolyn Kay Riggle, who was making her 12th trip with Honor Flight Columbus. Wuertz also served two terms as mayor, from 1978-81 and 1986-89. “It made me proud of my country to go down there and see all those memorials and remember what so many did for us, the ones who didn’t come back,” said Wuertz. The trip is completed in one day, with the veterans taking off at 6:30 a.m. and returning late that same evening. Wuertz noted he was treated exceptionally throughout the day and never had to worry about a thing, allowing the experience to be solely about conversations with fellow veterans and the wide spectrum of emotions at the memorials. 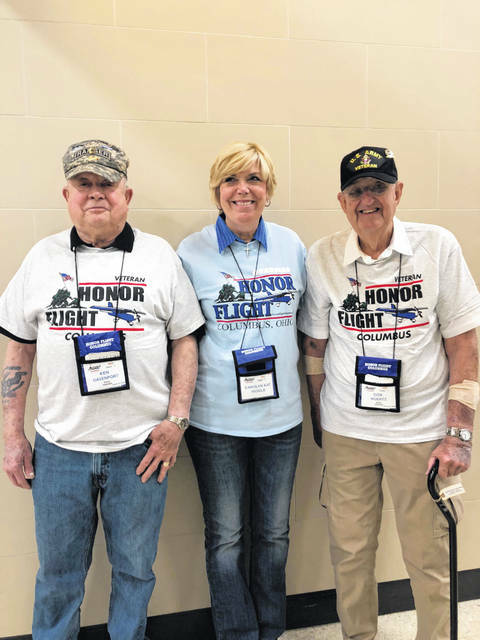 Honor Flight was co-founded by Earl Morse, a retired Air Force captain and son of a Korean and Vietnam war veteran, and Jeff Miller, the son of a World War II veteran and nephew to a B-29 pilot killed during the war. Morse, working at a Department of Veteran Affairs clinic in Springfield, Ohio, in 2004, began to realize most of his World War II veteran patients would never get to see their newly-constructed World War II memorial in the nation’s capital. Morse, a pilot, took it upon himself and flew two veterans to D.C. himself. Shortly after returning, he approached more pilots, and in May of 2005, six planes flew 12 veterans to D.C., marking the first Honor Flight. Inspired by Morse, Miller took the idea to another level, chartering entire commercial planes to transport veterans. The two merged their ideas into what is now the Honor Flight Network. “We’re helping them to share their stories, and helping them get comfortable enough to open with their stories to their families,” said Pete MacKenzie, executive director of Honor Flight Columbus. There is currently up to a two-year wait for Vietnam veterans to make the trip, but World War II and Korean War veterans are prioritized and put on the first available flight. Typically, there are seven flights per year out of Columbus. In total, the Columbus hub has flown over 5,300 veterans. Between all hubs, over 220,000 veterans have been flown to D.C., free of charge, to see the memorials.